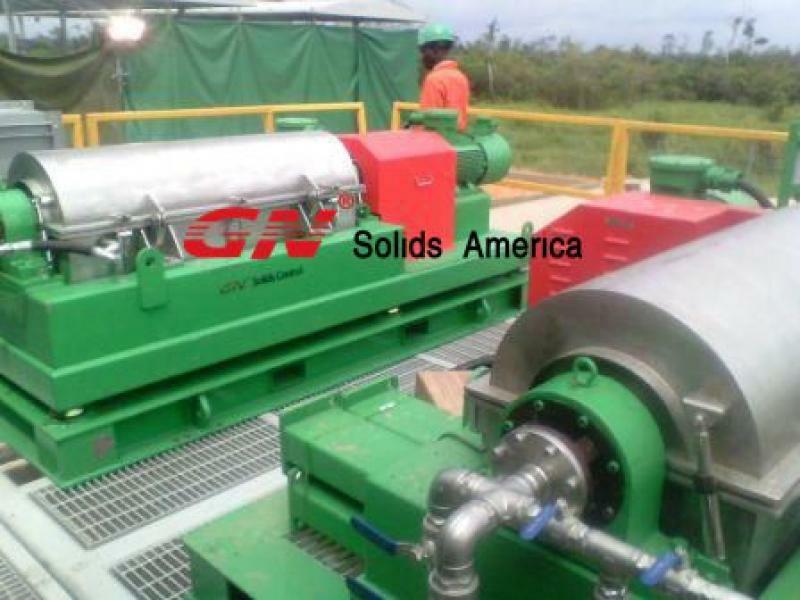 GN solids control produced GNLW223 dewatering centrifuge is widely sold for mineral exploration industry. 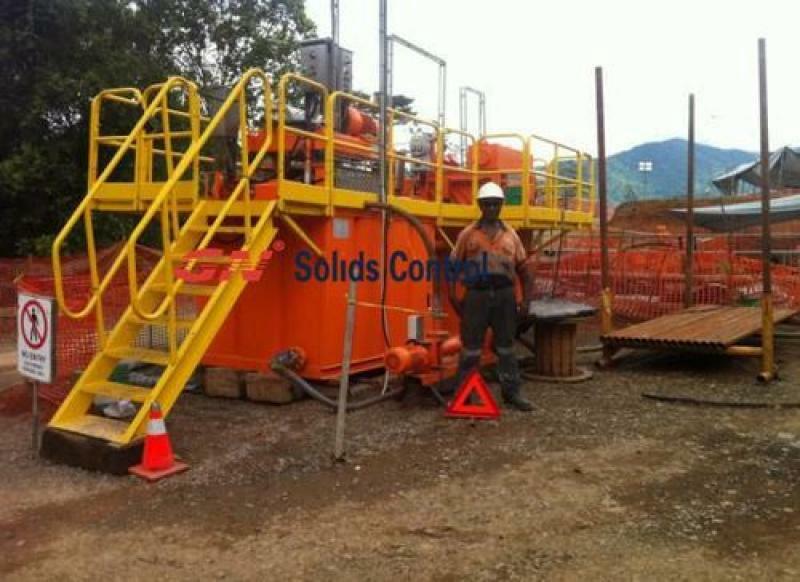 Also our unique designed solids removal unit is introduced to solve the problem of drilling cuttings dewatering and recycling the water and less cost. Now we have 1 unit of GNLW223 mini centrifuge with 3800rpm high speed in stock in Chile for sale, if you are involved in the diamond core drilling and under pressure to less the water consumption and less the cost for drilling, pls contact GN solids control for quotation. Most contractors in mining exploration industry have not aware the importance to use the dewatering unit, or right now the environmental regulation in their drilling area is not so clear and strict, so most of them do not use the solids separation unit for diamond core drilling. We believed that the benefits to use a solids removal unit will be take more attention to in the near future because the government already realized the necessary to issue the new regulation. 4 bowl speed: up to 4500rpm, could be customized, VFD available. This centrifuge in stock is electric motor drived, but we can make it without motor and control panel, so you can install hydraulic drive on it for electricity limit area. Also we have 1 unit of such centrifuge in Montreal, Canada for sale, and 1 unit of GNLW223 decanter centrifuge in GN Solids America Houston warehouse for show, together with the feeding pump 4 HP. You can get all of them after May, 2015. Pls contact GN solids America sales for the price. Decanter centrifuge can be used for various industries including food, chemical, paper, waste management, mining, oil recovery, oil & gas drilling, GN solids control brand decanter centrifuge is mainly used for drilling fluids industry, including solids control and drill cuttings waste management. GN produced drilling fluids decanter centrifuge including high speed decanter centrifuge, low speed decanter centrifuge, middle speed decanter centrifuge and variable speed decanter centrifuge. For high gravity drilling mud, we recommend middle speed centrifuge. For low gravity drilling mud, we recommend high speed decanter centrifuge GNLW363G with 3200rpm rotary speed. If you bought our variable speed decanter centrifuge GNLW363VFD, you can adjust the speed by the PLC control panel. 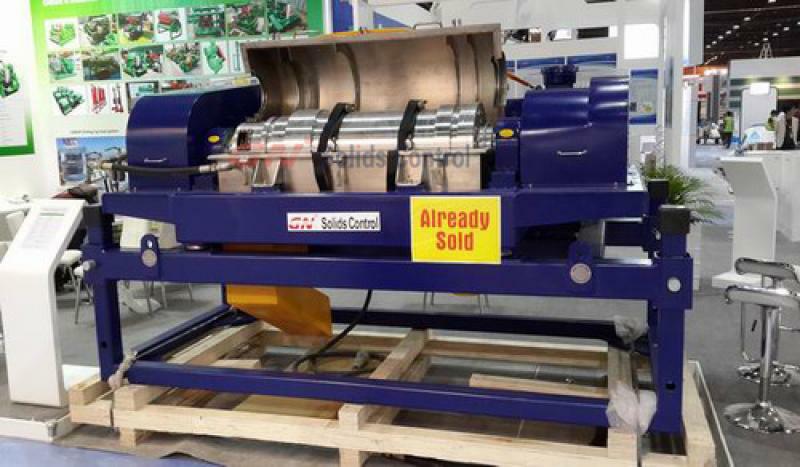 If you bought our rated speed decanter centrifuge, we can provide 3 sets of extra pulleys to change the high speed to middle speed or low speed decanter centrifuge. 1 Lubrication according to the lubrication chart we recommend, especially for the 2 bearing blocks, gear box, hydro-coupling. 2 Cleaning and flushing: the centrifuge bowl inside and outside should be flushing after every time start, to avoid the solids accumulated around the solids discharge port. 3 Proper feeding capacity to ensure there will not be too much solids accumulation. 8 Proper transportation and storage: During transportation, the safety guard should be tighten; and during operation, it should be released. 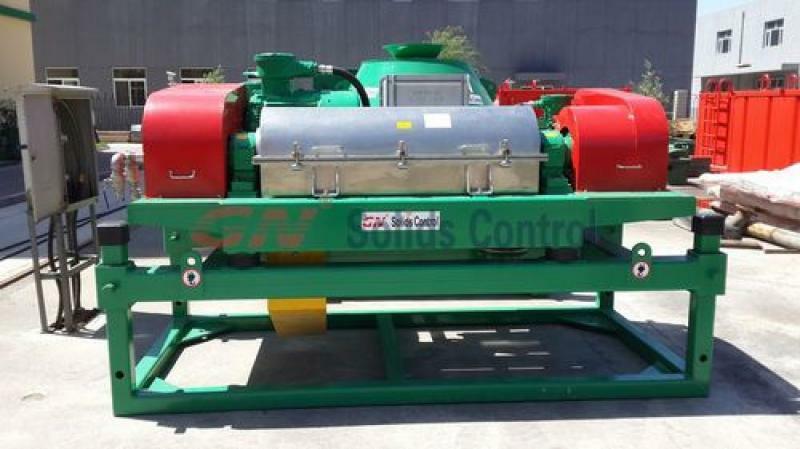 For more questions about decanter centrifuge operation, pls contact GN solids control sales. GN new designed drilling mud decanter centrifuge GNLW363G adopted a new designed lubrication system compared with traditional Chinese centrifuge, you should lubricate the equipment according to the schematic view of lubrication position, the lubrication table is showed on a steel plate which is connected by bolts with centrifuge. The centrifuge has two lubrication points, including main bearings respectively at the big and small ends of the bowl. N220 hyperbolic gear oil should be chosen for the gearbox lubrication in winter while N320 hyperbolic gear oil should be chosen in summer. At the factory, this centrifuge has been filled with sufficient grease at each bearing, and the gearbox and hydro-coupling have been filled with sufficient oil, which has experienced no-load running test for 4 hours. When new machine or unit after storage is again put into operation, the user should examine that whether each lubrication point, gearbox and hydro-coupling have trace of oil leakage and fill oil if necessary. GNLW363G and GNLW363VFD centrifuges can be used for barite recovery when their rotary speed is adjusted to middle speed. We can provide middle speed pulley for GNLW363G centrifuge when it is used for barite recovery. GNLW363VFD centrifuge is variable frequency drive centrifuge. When operation, increase the pond depth until the recovered solids become “runny”. Buoyant force reduces the torque to convey solids out of the centrifuge. A shallow pond creates a long beach section. Once the solids exit the pool, the extra energy required to convey these solids results in higher torque.